In light of the news of Tesco, Southwark Council and now Swansea Council removing their 'anti-homeless' spikes in response to my demonstration, I decided to dig a little deeper and find out how these things managed to get signed off in the first place..
A source at Westminster Council has passed on copies of the original planning application documents submitted by Tesco. You’ll notice here the 'raised studs' feature quite clearly. Approval was granted by Westminster Council for Tesco Plc to go ahead with the installation. Interestingly what also features within Tesco's application was the intention to install two (2) benches outside the very same store in Piccadilly Circus - these benches never appeared. We’ll come back to this later. On Thursday 12th June at around 4pm Tesco took the decision to remove the ‘anti- homeless’ spikes from their Piccadilly Circus store, seemingly as a result of the relentless bombardment of incoming emails. Not to mention the onslaught of negative feedback they were faced with on social media. ''Customers told us they were intimidated by anti-social behaviour outside our Regent Street store and we put studs in place to try and stop it." "We put these measures in place at our Regent Street store, to prevent anti-social behaviour. We do understand that these studs have caused concern for some, who have interpreted them as an anti-homeless measure, or feel that someone may be hurt if they trip and fall onto them. I am happy to advise that we have now removed them, to address these concerns." Tesco tried to prevent anti-social behaviour by installing spikes. Spikes to "stop people engaging in behaviour like smoking or drinking outside the store". Why then would Tesco include the installation of two benches on the same planning application? They wish to discourage loitering outside the store, however in the same application mention installing benches. This doesn't quite add up. This completely contradicts the planning application and the reasoning Tesco gave for the installation of the spikes. Was the inclusion of two benches a tactical effort, to seem more responsible and community conscious, in order to get the application through? Were the spikes really installed to "prevent anti-social behaviour" as their press office states? Or was it just an ill-conceived line, to try and lessen the guilt now they’ve been called to account? I insist the spikes were installed to get rid of rough sleepers in the window ledges. Rough sleepers who I’ve seen first hand bedded down for the night in these large window recesses, sheltered from the elements and more importantly the cold ground. At night. Outside a closed store. I'll let you draw your own conclusion. My campaign is now calling for a national ban on all forms of ‘anti-homeless’ deterrent. 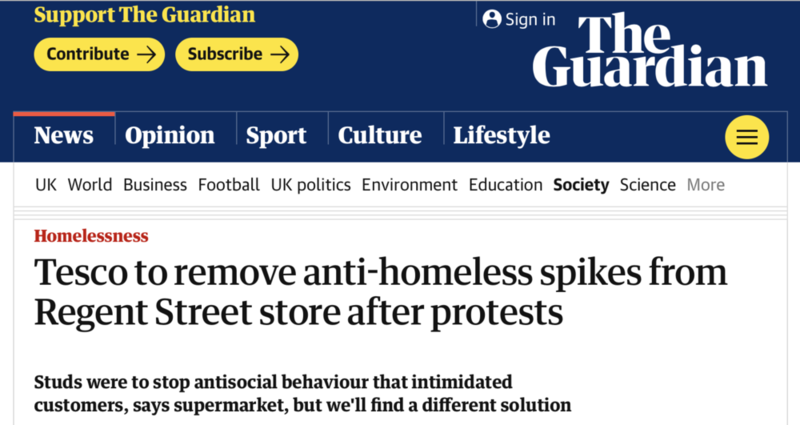 We are gaining momentum and activists are now beginning to put pressure on local councils - specifically Westminster Council who approved the planning application for Tesco’s installation of ‘anti-homeless’ spikes. As a society we should be doing more to help the homeless. But instead we’re systematically isolating them further. Humans deserve to be treated with compassion regardless of their social situation. It’s apparent we've already started a movement, especially with news coming in of spikes being ripped up in all corners of the country. Let's continue to put the pressure on and demand a ban so corporations like Tesco can't do this again. Will CISPA be the end of a free world? Will the internet remain the one open channel of communication where humanity can bypass filters and barriers? 'CISPA' is to keep us safe we're told. But from who? Authoritarian regimes are pushing for full governmental control of the Internet in a binding global treaty -- if they succeed, the internet could become less open, more costly and much slower. The Internet has been an amazing example of people power -- allowing us to connect, speak out and pressure leaders like never before. That's largely because it's been governed to date by users and non-profits, not governments. But now the USA are trying to pass a new law called the Cyber Intelligence Sharing and Protection Act (CISPA) to bring the Internet under its control -- the web would then ultimately be shaped by government interests and not by us, the users. Tim Berners Lee, one of the "fathers of the Internet," has warned that CISPA could increase censorship online and invade our privacy. The somewhat ignorant question "if you've got nothing to hide then you've got nothing to be scared of" was put at me earlier today. That might be the case with things that are happening now, because people agree with most of the laws that are being passed today. Just imagine though, we get to the stage that laws are being forced upon us that we no longer consent to, by then with CISPA in action it'll be too late to protest. "Anything you've ever said, posted, geo-tagged, typed or browsed could be used against you." The worlds largest facial recognition database, you know, the one that is covered up and packaged as a convenient way to tag your friends in photos will be accessible by the worlds security services. Imagine ANPR for the human face. Imagine the state knowing your every move by combining CCTV with facial recognition. What's interesting is Facebook is a key supporter of this bill. Just remember you're not the customer when the product is free. An open and universal internet is the most effective tool we have to address the issues that affect the world at hand. Therefore protecting it is the most essential task that stands before our generation. We must not lose the internet. He who controls the internet controls the data, and he who controls the data controls our future. "We're told we need safety, which is precious yes. But can a society that can enforce all of its laws ever progress?" Many figures guilty of thought crime like Nelson Mandela turned out to be luminaries and heroes before their time. But if a surveillance state had silenced them just think of all the progress we would have been denied. Would lobbies for women or gay rights have appeared and thrived? Would revolutionary ideals have materialised? Would science have pioneered or even survived if every word had been monitored by thought police and spies? You can almost guarantee the powers will be used to spy on the general public rather than to pursue malicious hackers. Given the right to stick your nose in anywhere, you would right? I'd definitely have a poke around. Humans are curious beings, knowledge = power. A totalitarian regime is not something I'd want to be part of. We fought world wars to eradicate policies and trends like this, let us not sit back and let this bill be passed. They'll be freezing our collective hopes. It doesn't protect our safety but it does protect the status quo. They threaten this internet, the one channel yet uncontrolled who's openness we are now called upon to protect and uphold. A picture is worth a thousand words, most of the time. Written word, prepared prose - you’ll find that here.